I found out what day my transfer was going to be 6 days in advance, once my LH surge was confirmed via blood work. 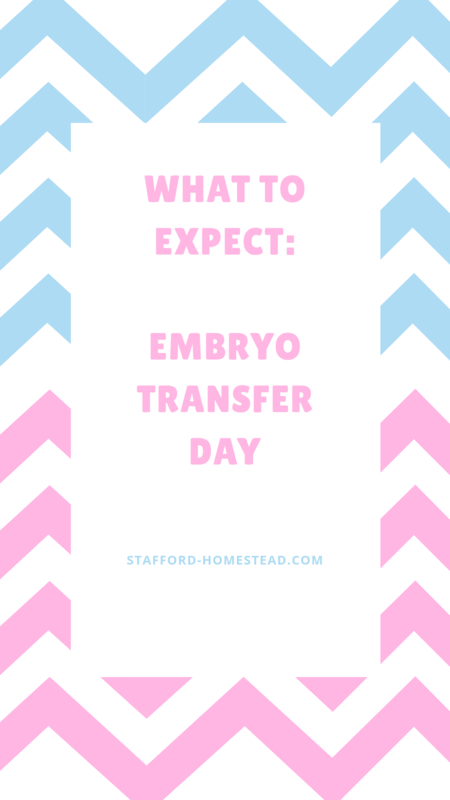 If you do a medicated cycle you will likely know you transfer day much longer in advance. I requested the day off from work, as it is recommended to be relaxed after the procedure. Two days before the transfer they told me what time to come in. I was scheduled for 12:30, but they asked me to arrive at 11:45 to have blood work done first. I made sure to go to bed early the night before, I got a full 8 hours! I woke up early and went to the chiropractor for a 7:30 appt. I was originally scheduled for a couple of days after transfer for my appointment but I wanted to get it in sooner to make sure my spine was well aligned for the transfer. After that I came home and did a half hour of yoga. I prepared stew for dinner to simmer all day while I was gone. I cleaned the kitchen and got ready for the beach for after transfer. Since diet is hugely important to fertility I had my meals planned for post transfer. For lunch prep I made a huge pot of vegetable soup with collard greens, chard, kale, lentils and summer squash, all organic from my CSA farm share! I had that all divided up for today and the next weeks lunches. For dinner I made my first Rabbit Stew with sweet potatoes, carrots, quiona, lentils. I began raising rabbits for meat this year and this was our first batch of rabbits. I made a big pot of dandelion and ginger tea the day before and filled up a liter thermos with it to take with me. You need a “comfortably full bladder” for transfer. I didn’t drink a lot more than normal, I just had a large mug of tea about 2 hours prior to transfer. My bladder was very full, but manageable. They called me in and asked me to verify my name, DOB, & last fuor of SSN. The clinic is a very large room with multiple curtain dividers, The nurse brought me to my little area and put a name bracelet on me then had me change. They gave me two robes, one goes on forward and one backwards, they had me undress besides a bra. I got a little hair net and some hospital socks. The nurse had and interesting question for me “What type of chocolate do you like?” I said dark chocolate. They left a bar of chocolate on my gurney in my changing room when I returned from the transfer… It was sooo nice. I have given up chocolate for the past few months so I really enjoyed it, and it must be OK if the Dr.s are giving it to me!! I came out of the changing area and when to the end of the room in a private “waiting” area they had a warm blanket waiting for me. The nurse went over how the procedure would go and the post procedure information. They asked me if it was OK if a resident doctor observed. I said that was fine. My doctor came in shortly with the student. They verified my name, DOB, SSN again. They said how they have a 21 step verification process. She gave me a photo of my embryo and said it was perfect. We walked down to the surgical suite, the same room I did my egg retrieval in about a month ago. So the bed was comfy with the leg rests instead of stirrups. They actually reclined the bed to allow better access which reduces the pressure on you bladder. The student showed me on the ultra sound screen where to look when the put the embryo in. The embryologist came out and verified me name, DOB, & last 4 SSN. for the 5th time that day. The doctor put the sspeculum in (COLD) then cleaned the cervix, then put in the catheter, once it was in they brought out the embryo, seconds later they snapped a photo on the ultrasound screen and showed me where the embryo was. They check catheter to make sure the embryo doesn’t get stuck inside. Everything went perfectly. They cleaned up a few things around me while I laid there. They had no recommendation or requirement to remain laying down for any amount of time. They said that the laying period is not proven and mostly out dated concept. It was such a happy feeling knowing I have a REAL LIVE EMBRYO inside of my uterus. I am PREGNANT and should take care of myself as pregnant (until proven otherwise). I’ll have my pregnancy test in 9 days (since the embryo is already 5 days developed) which is nice I don’t have to wait a whole two weeks. They said I did not have to remain in bed for the rest of the day, just to take it easy and don’t over exert myself. I planned on going to the beach with my sister and her kids so that’s what we did! I will update soon on giving yourself intramuscular injections. Once I get my results of course too. Until then I will be enjoying being pregnant! Eating all my warm foods, keeping my toes nice and warm, gentle yoga and walking, meditations before bed, plenty of good sleep and trying to be stress free. Previous My “Natural” Cycle for Frozen Embryo Transfer. Next Video: Giving yourself IM Progesterone.